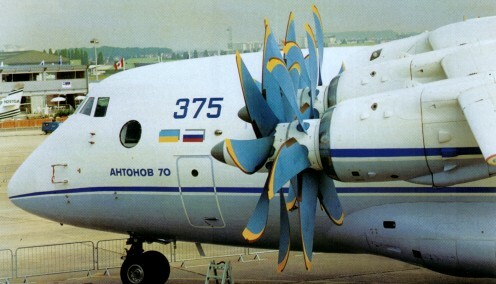 The development of the An-70 program began in 1975 but the collapse of the Soviet Union effectively stopped the funding of most major new programs. 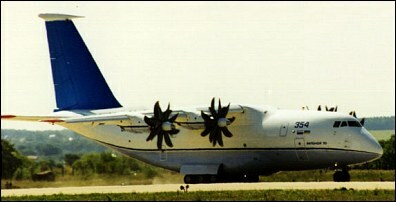 The An-70 has the high wing and tail loading ramp for a tactical freight aircraft and uses contra-rotating propfans. Each propfan has contra-rotating propellers; the front has eight composite blades, the rear just six. A new propfan medium-size wide-body short take-off and landing transport aircraft intended to replace An-12, the first flight was achieved on December 16, 1994 but the first prototype crashed on 10 February 1995 after colliding with its An-72 chase plane. Construction of a second prototype was completed, which began flight testing at Gostomel airport in Ukraine on April 24, 1997.